The funny thing about May in the gardens is that I enjoy it at a trot. There is just so much to do that only at dawn and dusk can I wander around at a leisurely pace and savor the return of so many beloved Flower friends. The rest of the time it,s all a bit of a blur. A pretty blur but still a blur. The Roses did very poorly through this last long cold winter so one thing I have been cutting away hauling off this week is dead branches from our Rose bushes. It looks like almost every Rose survived but many are in need of being cut back almost to the ground. In between weeding projects, I pick away at each of the farm’s 75 Rose bushes. Another project clamoring to be competed is preparing the gardens to plant the annual crops including Red Shiso. The Red Shiso seeds don’t go into the ground until frost danger is passed but we still need to get the garden spaces where we plant the Red Shiso ready. Being rather luddite in our equipment, this means pitchforks, claws and shovels not a rototiller. This is better for the soil but not perhaps for our backs. In amidst weeding, pruning and planting, so many Flower Essences need to be made right now. Each sunny morning I make old Flower Essence friends that need replenishing as well as new Flower Essences that you have asked for or that are calling out to be made. This week I made Cherry Flower Essence from our Montmorency Cherry trees for the first time. This Cherry Essence joins an enormous group of Fruit Tree Flower Essences including Pear, Peach, Plum, Crab Apple, Loquat, Quince, Medlar, Lemon, Lime, Orange and Grapefruit. I look forward to sitting down with the Angels and Elementals to find out the strengths of this new Flower Essence friend….. but probably not until June! Here are the Cherry blossoms on the day I made the Essence. In the early years I didn’t think to take a photo of the Flower when I first made it into a Flower Essence, in part because I had no sense of any larger plan that included sharing the Flower Essences. This led to YEARS of filling in the blanks with photos taken later. In fact, as Katie Carpenter gets organized to rebuild our website from scratch, there are photo gaps we are still trying to fill. We almost managed to coax our honeybees through the coldest winter on record, then they died in February. Laura and I wrapped the hives so carefully and fed the bees honey whenever their was a thaw, but there just weren’t enough thaws. We had thought we had gotten them through so it was a very sad day when we realized all three hives had died. We have two new hives coming but the supplier won’t send them until the end of June which is, frankly, a nightmare for pollination. The cold winter killed lots of other kinds of pollinators too, and the decline in various bees around the farm is noticeable. Mercifully, a beekeeping friend just gave us a hive to tide us over until our two hives arrive in June. Jim brought the hive home on Monday. I am so grateful to this beekeeper for sharing a hive. 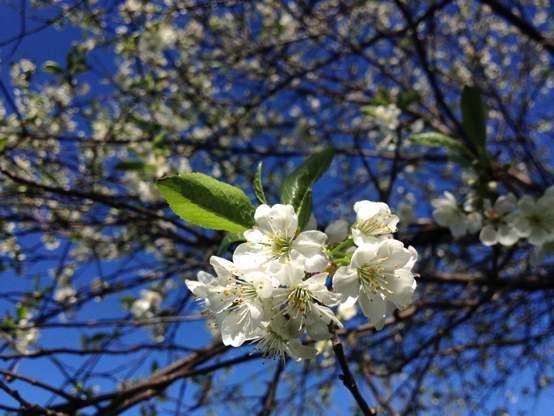 They arrived in time to pollinate the Apple and Cherry trees- I am not sure if we will have much of a Plum, Pear, Black Currant or Red Currant crop as these bloomed before this hive arrived. Here is Jim taking the seal out of the front of the hive so that the bees can leave the hive and explore their new home. The seal was put in place so they could be moved from their former home in Springfield, VT to here. This new hive appears very happy and busy. All of us share in this happiness. It is wonderful to have honeybees here again after the losses of the winter. On a woods walk this week, Elizabeth and Reina had a close and lovely encounter with a bear, so we know there is a bear in the neighborhood. 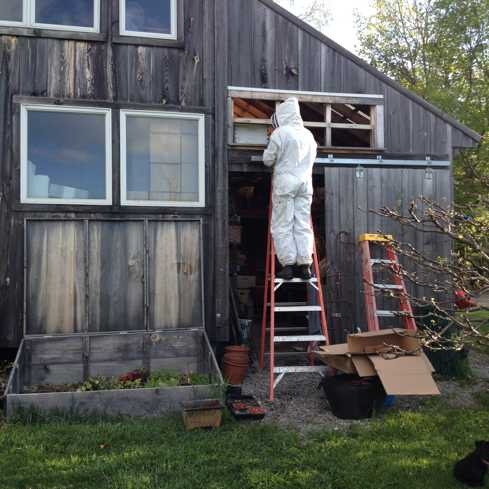 We remain committed to keeping the bees in these second story quarters, out of the neighborhood bear’s easy reach. This morning I am tearing myself away from the gardens for an hour or two to go get groceries. We have been living on stranger and stranger supplies these past few weeks as I just can’t waste time from the gardens to go on a shopping mission when there is something I can throw together from the freezer. However William is coming home from his first year at college tonight. I think the absence of cheese, milk, butter, ice cream, chips, salsa, cereal, cookies or even pasta may be be too much of a shock after nine months of a dining hall cornucopia. So this morning I got out the Green Hope Farm cookbook and made my list so I can cook him some of his favorites. I think Jim is going to be a happier camper too. I don’t think the heaping platter of Wild Leeks I served up last night for dinner felt like a complete meal to Jim either. Oddly enough, this is the most recent photo I have of Will. 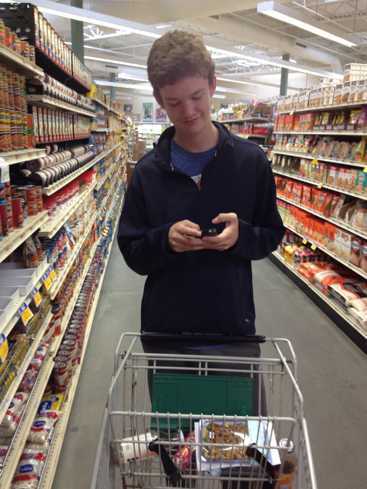 Here he is buying supplies for his dorm room at the end of his last vacation. Not to worry Will! There WILL be something besides freezer burned peas for supper tonight!